You have no idea how big of a weight off my shoulders it is to be done with the 3. This route has haunted me ever since I found out about it, because it's really two separate routes. The 3A and the 3B spend less than half their running times together! Look at this madness! It doesn't help that the route is really infrequent on its branches most of the time. Okay, so why not walk from one to the other? They look close. Yes, they're geographically close...but the branches end on separate peninsulas! COME ON!!! Well, I'll stop complaining about how hard it is to ride the route, and just...ride the route. We'll start with the independent section of the 3A. The bus coming down Narragansett Boulevard. Going southbound, the route first splits from the 3B at Broad Street. The 3B goes down Warwick Ave while the 3A continues down Broad, which started out with a lot of businesses. However, it quickly became residential, lined with dense but suburban houses. Suddenly, the retail started to come back. Indeed, charming businesses were now lining the street on both sides! It felt like a classic New England town center - this was Pawtuxet Village. We went over the beautiful Pawtuxet River, which had a ton of boats lined up in a nearby cove. The road became Narragansett Parkway on the other side as we entered Warwick. There were a few more businesses and a lovely park before it became a residential neighborhood once again. We zoomed past a ton of charming houses that were only broken by one apartment development, after which the road started hugging the huge Providence River. The houses sorta lost their charm at this point, looking more like typical Rhode Island suburban homes, as Narragansett Parkway curved westward. We made our way back to Warwick Ave, joining up with the 3B. This was a big change from before - now we were passing gross suburban businesses and really ugly shopping malls with a ton of vacant retail space and huge parking lots (although I'm contractually obliged to point out this store). And just like that, we left the 3B again by turning onto West Shore Road. The 3 is two separate routes, I'm telling you! There were some residual suburban businesses along West Shore Road, but it eventually made its way back into a residential neighborhood. That being said, we still did see some bursts of retail at various points, and in particular, there was a village of sorts called Conimicut. I didn't think it had anywhere near the charm of Pawtuxet, as the businesses were more spread out and a lot less interesting. There was a connection to the 29, another headache of a route to ride, here in Conimicut, but we were on our own again beyond the village. It went back to being mostly suburban houses, though we got a break with some marshland when we went down Tidewater Drive. This took us into the Riverview neighborhood, which was...more houses. And that's about it. A marshy river on Tidewater Drive. We turned onto Longmeadow Ave next, and then Samuel Gorton Ave. This took us to Warwick Cove, where we turned onto Warwick Neck Ave. We entered the Warwick Neck neighborhood along here, but since it seems to become much more wealthy the further south you go, the bus terminated at a tiny busway at the intersection with Barton Ave. The bus laying over at its busway. From here, Josh and I made the walk to the 3B, which begins at a place called Oakland Beach. It is, in fact, a beach, and we took some time to step out onto the sand and appreciate the amazing view. "Hey, are you guys selling Pokemon cards?" a sketchy guy asked from his pickup truck. Okay, I guess shady things happen at Oakland Beach in the winter. At least the views are still nice! We walked back to the busway past Iggy's Doughboys & Chowder House, Iggy's Boardwalk, an overflow parking lot for Iggy's customers only, and a sign saying "Welcome to Oakland Beach - the home of Iggy's" featuring a strange anthropomorphic something-or-other mascot. Boy, talk about a monopoly! There were a few other people already waiting for the bus, including someone who was having a very spirited (i.e. swear-filled) conversation with someone else on the phone. There were a few beachy businesses along Oakland Beach Ave, but it was mostly residential, particularly as we got further inland. However, we eventually went by a skate park, an elementary school, and an intersection with a ton of suburban retail. There was a brief break from that, but once we merged onto Warwick Ave, that was it - suburban businesses with parking lots everywhere! The intersection with West Shore Road. No idea what this is, but here it is! I will say that Warwick Ave got tamer when the 3A left us. A slightly larger share of it was dedicated to houses, and though the businesses that showed up were still awful, at least there were less of them. We even went by a pond, so that's nice! All good things must come to an end, though, and we were soon running past all gross suburban businesses again. We were joined by the 1 when it came off of Post Road, not that the scenery changed much. We crossed the Pawtuxet River into Cranston, going by a Shaw's and a Stop & Shop on opposite sides. There was a more residential bent to Warwick Ave here, and it was certainly a nice change from what we had been seeing before. We eventually turned onto Norwood Ave, finally rejoining the 3A, and the two routes would now be together until Providence! Ah, beautiful houses! It was all houses! Yes, Norwood Ave was quite a relief. The homes continued as we turned onto Narragansett Boulevard, entering Providence and coming close to Johnson and Wales University. There were actually a few businesses along this section, too, but they were integrated with the neighborhood, not just sitting behind huge parking lots. This is one of them, I assume...? Boy, I shouldn't have been complaining about all those suburban businesses, because the 3 decided to throw a serious curveball. Once the street became Allens Ave, we entered one of the most desolate industrial areas I've ever seen! Think Eagle Square in East Boston on steroids. There were huge wastelands of random pipes and huge vats as far as the eye could see! It was hard to get a good picture because we were speeding through so fast. The surprises weren't done yet. Eventually, a train track came to the middle of Allens Ave. I have no idea if this thing is used anymore, but it's really hard to imagine huge freight trains running straight down the middle of a four-lane thoroughfare! There were all these spurs into random industrial lots, as well. A factory of some sort. Finally, we left the area by turning onto Blackstone Street under I-95. We then turned onto Eddy Street, joining the 1 and passing the Rhode Island Hospital, although unlike the 1, we didn't deviate into it. We went under I-95 again and entered an older industrial area with a lot of brick buildings. The street became Dyer Street as we entered an area that's trying to develop...but right now it's just kind of a no-man's-land. Dyer Street became Memorial Boulevard as it came along next to the Providence River, and we looped around the skyscrapers of downtown Providence before entering it on Kennedy Plaza. And with that, one of the most annoying bus routes to ride on the RIPTA is complete! Ridership: The 3's ridership is...okay. On the outbound 3A, there were 10 people, although all of them got off before the independent section of the route. On the inbound 3B, meanwhile, we got 15 people, many of which came from the independent section. Pros: As a combined unit, there's no doubt this thing serves a lot. The entire western bank of the Providence River is practically dominated by the 3! The route has decent frequency on its trunk, with service every 20 minutes at rush hour, every 35 minutes during the day, and every 50 minutes on weekends. Cons: But remember, this is basically two separate routes. That means that for the vast majority of the 3, buses are running every 40 minutes, 70 minutes, and 100 minutes. Can you imagine how packed the 3B in the summer must get to Oakland Beach with those weekend frequencies?? Or maybe no one uses it because it never freaking comes! And remember, half the trunk is in an industrial wasteland anyway, so the trunk frequencies are basically irrelevant. The 3 is not one route, it's two. I mean, it doesn't even know what to call itself - the route's subtitle is "Warwick Ave," but the 3A is only on Warwick Ave for about two minutes! The 3 is just two really really infrequent routes, and honestly, they should be treated as such. I think it would make more sense if the 3A and 3B got separate schedules, because there's not point in trying to fool people that this is "one route" with service "every 20 minutes" at rush hour - that's just not true. 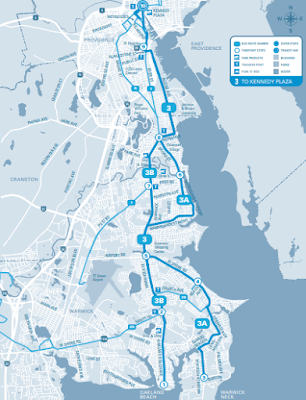 This route is primarily designed to serve suburban commuters from Warwick, into Providence. Hence the the low frequencies, designed for weekday commuters, with local transit not the primary objective. In fact this route is the direct descendant of a interurban trolley line that ran to Oakland Beach and Rocky Point Park. up until two years ago this route was much different. The 3A was partly on the Number 1 bus and it never went onto Warwick Ave just across it. The 3A had been just Warwick Ave and West Shore Road to Rocky Point. It was never on Narragansett Pkwy. The 3b remains the same today to Oakland Beach. The summer schedule is increased to 30 minute headways on each segment. Thus that small piece of Warwick Ave on the 3A has 15 minute service.